Wednesday is always a bit of a relief to get to. And this Wednesday is definitely no different in that respect, the weekend is almost in sight and Friday is just about on the horizon. After spending approximately £10831 on coffee and a solid 8 hour laptop stint yesterday, I have just sent off my first 3,000 word essay of the term and to be honest, I want nothing more than to sit in bed and listen to Stephen Fry read me Harry Potter. But alas, I have a blog post to write. So I thought I'd write a bit of a similar ol' thing to a lot of bloggers who write about their weekly happiness, except mine is going to be a midweek post. What's eased the pain of the essays, and what else I have to look forward to in the rest of the week. 1. So, I downloaded Audible, admittedly with one thing in mind. That's right, hola Harry Potter. Me and my Dad have been listening to the Harry Potter audio on car journeys over the last few weeks as my broken foot life has involved a lot of long car rides. But with the knowledge I wouldn't be in the car for a little while, I decided to get my free audiobook. 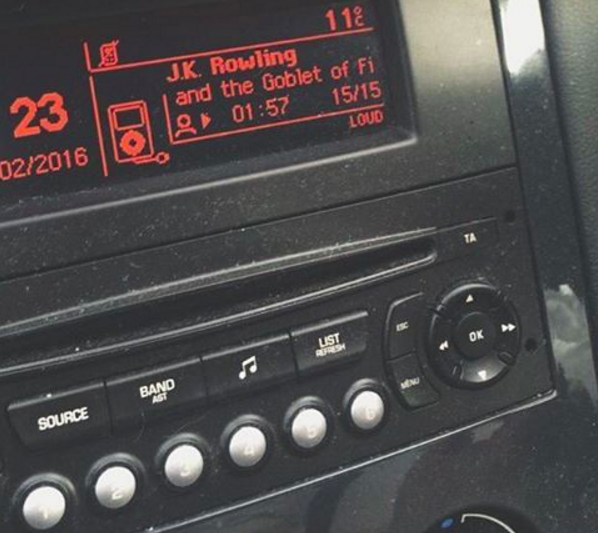 And after starting The Goblet of Fire in the car the other day, I decided it was necessary to listen to the other 19 hours. I am currently LOVING drifting off to the sound of Stephen Fry. 2. As previously mentioned, I finished a 3,000 word essay. Which was particularly hard as the lecture was during the 'foot elevated 50 minutes of every 60' period in of January, so I had to learn everything from scratch. And I think it's actually not too dreadful. 3. 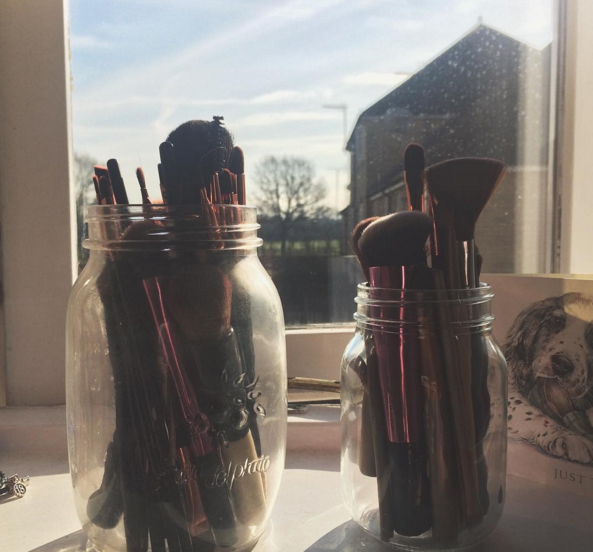 The satisfaction of having a makeup artist worthy brush collection. I know, I may have too many, but I'm loving the mason-jar life at the moment. 4. I started on Kayla Itsines BBG. Although obviously not fully, leg day is a no go. But every morning I've dedicated a bit of time to abs and arms, because I'm just so bored of being so inactive after 8 weeks. I probably should have thought of this before, but I was far too busy pitying myself. 5. I have a job interview on Friday. And it doesn't matter whether I get it or not, because it's the first sign of me being like, okay, I'm not going to Washington DC but I can still have an amazing summer and do great things and not worry about lack of America-ness. 6. I managed to walk down to my work for the first time since breaking my foot, which is an achievement in itself. But to add to make it even more worth it, I wrote 1200 words of that essay, had my first Bubble Tea in donkeys years and was visited by my two friends Alvaro and Elliot, who came to relieve me/help me procrastinate yesterday during my essay writing. And after having not seen them in about 3 months, I was absolutely bloody delighted to see their faces and have a bit of distraction. I'm going to leave it there as all I want to do is sleep forever and listen to Harry Potter. Aw I always used to listen to those HP audios when I was little, every night my Mum would put them on and I would fall asleep to them, Stephen Fry's voice is so calming and warm. Enjoy them!